One method of getting rid of swirl marks is to basically fill up the mark with a filler (a bit like anti-wrinkle cream!!) so that there’s no longer a hole and sharp edges to catch the light. This method I prefer for working by hand as it does not require massive effort to break a product down, and by hand this method achieves better results. 2 What Are Swirl Marks? 3 Where Do Swirls Come From? 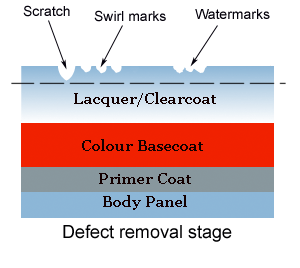 If you look at a cross section of clearcoat paint, you will see three basic layers of paint on the bodywork of the car – the base coat, the colour coat and the clear coat. 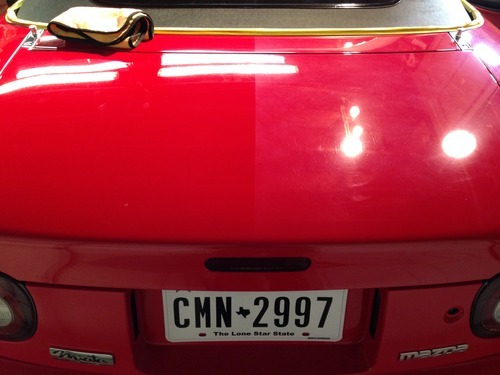 If for example you get a deep scratch in your paint, you may see a different colour of paint revealed – this means you scratched down through the colour coat and into the base coat at which stage machine polishing cannot remove the scratch, you’d need to fill and wet sand and then polish. 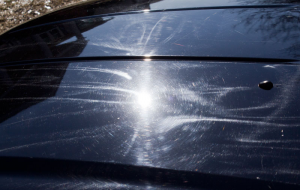 If you look at your car under a bright light, for example sunlight, sometimes you may see very thing scratches in the paint. There can be lots of these, like someone’s draped multiple spider’s web across the paint. These tiny scratches are catching the light such that it masks the colour underneath and you don’t see it. This robs the paintwork of its true deep colour. The sharp edges of the swirl mark are catching the sunlight and directing it up to your eye so you see sunlight along the swirl mark, not the paint colour. This is why these bleminshes are particularly prevelant in bright lights – sunlight, halogen lights in petrol stations are kinds of light that really show up the marks! Poor Wash Technique – washing using a sponge traps grit between the surface of the sponge and the paint, dragging sharp grit across the paint and scratching it. Automated car washes do this on a grand scale by essentially battering grit into the paintwork and should be avoided at all costs. Using the Wrong Buffing Towels – using the cheapest cotton stockinette you can find in Halfords will inflict swirls to the paint as the material is hard and unforgiving, itself inflicting scratches without even the need for grit particles! However, all is not lost when swirl marks appear, it is possible to either mask them (by hand) or remove them completey by machine polishing. One method of getting rid of swirl marks is to basically fill up the mark with a filler (a bit like anti-wrinkle cream!!) so that there’s no longer a hole and sharp edges to catch the light. This can be achieved by using products such as paint cleansers, some glazes and even some sealants contain fillers. When applying a paintwork cleanser, work the product well into the paint to fill the swirl and be prepared for a prepeat application if more filler is required. Paintwork Chemical Cleanser – work this well into the paint with medium pressure and remove from surface immediately – working on small areas at a time (2′ by 2′ roughly). Repeat application if necessary. These cleaners also help remove oxidisation from the paintwork too. Glaze and Seal – can be done in one step or too, glazes will deepen and wetten the shine and most will further fill and hide the swirl marks. Sealents protect the shine and seal in the fillers, as they can be washed away very easily. Apply the glaze in circular motions first with medium pressure then finish in a fore and aft motion. Work on small areas at a time and remove residue straight away. Optionally, top this off with a pure wax to give the icing on the cake, and you choices of wax are endless. Apply to one panel and remove immediately as if left too long to dry, it can be a bit of a pest to remove. While filling the swirls works in the short term, there is the disadvantage of what happens when the fillers fade and show the original swirl marks. 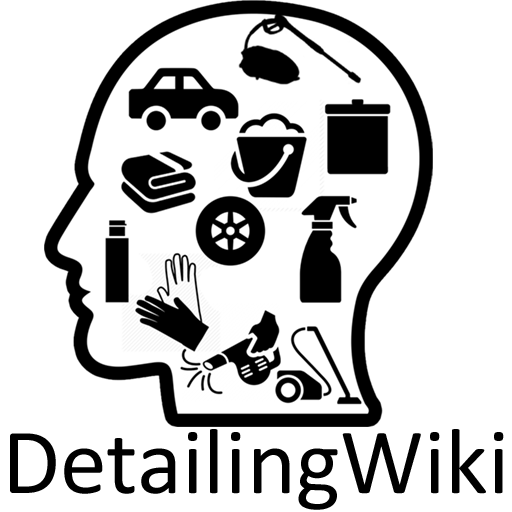 The swirl mark starts to come back which will then require filling again in order to hide it and this process goes on and on. By hand, this is the most effective way to hide swirls, but you can do better by machine.